UFC veteran and TUF season one cast member, Nate Quarry, is set to face a challenge of another sort: television. He is now the host of the newest MMA show, the American Cagefighter. 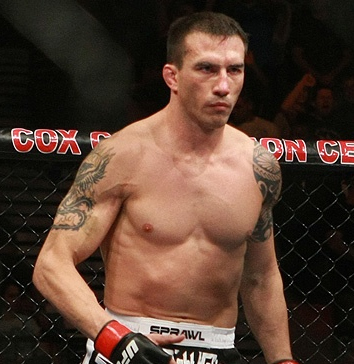 UFC veteran, Nate Quarry, has been tabbed as the host of a new series, American Cagefighter. The half-hour magazine show, that premiered last January 9 on Comcast SportsNet California, aims to promote and expose the rising stars of MMA. In addition to this, American Cagefighter will also feature action from MMA regional events. Airing weekly, the show promises appearances of Urijah Faber, Jake Shields, Tito Ortiz, Chris Leben, Mark Munoz, Chad Mendes, and Joseph Benavidez in the first few episodes. Nate Quarry, always remembered as one of the cast of the first TUF season, hasn’t fought since March 2010 after acquiring a TKO loss to Jorge Rivera. He undergone facial surgery after the loss, and has hinted retirement. However, Nate Quarry has yet to make any official announcements.